President Lincoln once told Congressman George Julian: “I do not see how he survives, why he is not crushed and torn to pieces. Without him I should be destroyed. 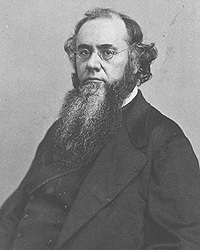 He performs his task superhumanly.”1 The object of Mr. Lincoln’s concern was Secretary of War Edwin M. Stanton. According to journalist Noah Brooks, Stanton was “what is popularity known as a ‘bull-head;’ that is to say, he is opinionated, implacable, intent, and not easily turned from any purpose.”2 That is to say, Stanton was not particularly likable – yet President Lincoln liked him. Stanton and President Lincoln came to share the burdens of the war. Like the President, Stanton understood the loss of a child. His infant son was buried about five months after Willie Lincoln died. Both men were doting fathers. In the last three years of the Civil War, their relationship was transformed. “By the war’s end, few men were on such intimate terms with Lincoln as the Secretary of War. Few men could write the President such chatty, personal letters as those Stanton dispatched while Lincoln visited the Virginia front in 1865,” wrote Lincoln biographer Stephen B. Oates. The biggest crisis in the Llincoln-Stanton relationship came in the aftermath of the Second Battle of Bull Run in late August 1862. Critics of General George B. McClellan blamed him for not coming quickly to the aid of the forces commanded by General John Pope. 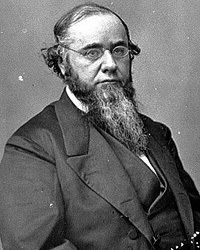 “In times like this, Edwin Stanton was given to violent responses,” noted historian Stephen W. Sears. “With the distant sounds of battle as accompaniment, he composed a ‘remonstrance’ for fellow members of the Cabinet to sign and present to the president. It charged General McClellan with incompetence, with deliberately disobeying his orders to aid Pope. Lawyer Stanton summed up for the prosecution: ‘the destruction of our armies, the protraction of the war, the waste of our national resources, and the overthrow of the government, which we believe must be the inevitable consequence of George B. McClellan being continued in command.”40 Secretary of the Treasury Salmon P. Chase signed the note but Secretary of the Navy Gideon Welles refused. It was as close to mutiny as Stanton or the most of the Cabinet ever got. It was an extraconstitutional usurpation of power, argued Burton J. Hendrick in Lincoln’s War Cabinet: “That Lincoln would have flatly rejected the cabinet proposal, even at the cost of a cabinet resignation en masse, events made clear. Perhaps the tensest of all cabinet meetings in the Civil War assembled on the morning of September 2.” The case against McClellan was falling short in another quarter; in order to safeguard Washington, President Lincoln decided to name McClellan to head the city’s defenses. The Cabinet, which had grown to distrust McClellan, was checkmated by action the President had taken earlier that morning. Frank Abial Flower, Edwin McMasters Stanton: The Autocrat of Rebellion, Emancipation, and Reconstruction, p. 369-370. Michael Burlingame, editor, Noah Brooks, Lincoln Observed: The Civil War Dispatches of Noah Brooks, p. 46 (May 2, 1863). William Hanchett, Out of the Wilderness, p. 88. Frank Abial Flower, Edwin McMasters Stanton: The Autocrat of Rebellion, Emancipation, and Reconstruction, p. 311. Noah Brooks, Abraham Lincoln: The Nation’s Leader in the Great Struggle Through Which was Maintained the Existence of the United States, p. 429. Ward Hill Lamon, Recollections of Abraham Lincoln, p. 231. Francis Fisher Browne, The Every-day Life of Abraham Lincoln, p. 268. Douglas L. Wilson and Rodney O. Davis, editor, Herndon’s Informants, p. 755 (Letter from William M. Dickson to Jesse W. Weik, April 17 1888). Frank Abial Flower, Edwin McMasters Stanton: The Autocrat of Rebellion, Emancipation, and Reconstruction, p. 62-63. Gideon Welles, The Diary of Gideon Welles, Volume I, p. 56-67. 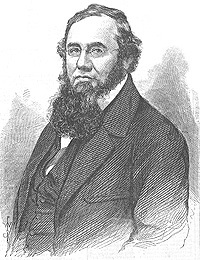 Fletcher Pratt, Stanton: Lincoln’s Secretary of War, p. 467. 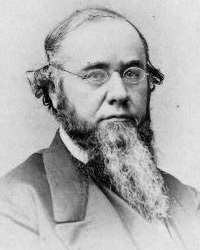 Fletcher Pratt, Stanton: Lincoln’s Secretary of War, p. 468. Michael Burlingame, editor, Lincoln’s Journalist: John Hay’s Anonymous Writings for the Press, 1860-1864, p. 196-197. Benjamin P. Thomas and Harold M. Hyman, Stanton: The Life and Times of Lincoln’s Secretary of War, p. 151. David Homer Bates, Lincoln in the Telegraph Office, p. 389-390. Michael Burlingame, editor, “Lincoln’s Humor” and Other Essays of Benjamin Thomas, p. 191. Allen Thorndike Rice, editor, Reminiscences of Abraham Lincoln, p. 518-519 (Edward W. Andrews). 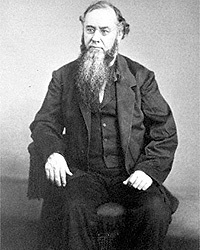 Michael Burlingame, editor, Noah Brooks, Lincoln Observed: The Civil War Dispatches of Noah Brooks, p. 47 (May 2, 1863). Stephen B. Oates, Abraham Lincoln: The Man Behind the Myths, p. 173. Stephen B. Oates, Abraham Lincoln: The Man Behind the Myths, p. 174. Ward Hill Lamon, Recollections of Abraham Lincoln, p. 239. Alonzo Rothschild, Lincoln, Master of Men: A Study in Character, p. 241. Fletcher Pratt, Stanton: Lincoln’s Secretary of War, p. 225. Noah Brooks, Washington, D.C., in Lincoln’s Time, p. 37. William Lee Miller, Lincoln’s Virtues, p. 425. Michael Burlingame, editor, William O. Stoddard, Inside the White House in War Times: Memoirs and Reports of Lincoln’s Secretary, p. 194 (Sketch 12, New York Citizen). Michael Burlingame, editor, “Lincoln’s Humor” and Other Essays of Benjamin Thomas, p. 200. Michael Burlingame, “Lincoln’s Humor” and Other Essays of Benjamin Thomas, p. 193. Rufus Rockwell Wilson, editor, Intimate Memories of Lincoln, p. 272 (William H. Smith, New York Herald Tribune, February 7, 1932). Alonzo Rothschild, Lincoln, Master of Men: A Study in Character, p. 260. Allen Thorndike Rice, editor, Reminiscences of Abraham Lincoln, p. 100 (John Palmer Usher). Josiah B. Grinnell, Men and Events of Forty Years, p. 172-173. Roy P. Basler, editor, The Collected Works of Abraham Lincoln, First Supplement, (Letter to Edwin M. Stanton, Feb. 12, 1864). Roy P. Basler, editor, The Collected Works of Abraham Lincoln, Volume VI, p. 313 (Letter to Edwin M. Stanton, July 2. 1863). Roy P. Basler, editor, The Collected Works of Abraham Lincoln, Volume VI, p. 335 (Letter to Edwin M. Stanton, July 17. 1863). Roy P. Basler, editor, The Collected Works of Abraham Lincoln, Volume VII, p. 466-467 (Letter to Edwin M. Stanton, July 27, 1864). Stephen W. Sears, Controversies and Commanders, p. 80. James G. Randall, Lincoln the President: Springfield to Gettysburg, p. 251. John Niven, Gideon Welles: Lincoln’s Secretary of the Navy, p. 397-398. Allan Nevins, The War for the Union: War Becomes Revolution, 1862-1863, p. 40. Allan Nevins, The War for the Union: War Becomes Revolution, 1862-1863, p. 39. Allen Thorndike Rice, editor, Reminiscences of Abraham Lincoln, p. 380-382 (John H. Kasson). Allen Thorndike Rice, editor, Reminiscences of Abraham Lincoln, p. 383-384 (John H. Kasson).